A burst of sunshine…in a martini glass! On an early Spring day, I was visiting my brother, and while he laboriously worked outside on his yard, I prepared a light and delicious meal inside. We started with olives, bread, and various cheeses, as well as this refreshing aperitif before sitting down to dinner. It doesn’t have a name – feel free to comment a suggestion, if you try it. In a martini shaker, add cubes of ice and 1 oz. of each of the following: Gran Marnier, San Pellegrino Blood Orange Soda and Carrot Juice. Add 2 oz. of Pear Vodka. Slice two or three leaves of basil (you know, by rolling them up stacked and slicing into strips), and add to the shaker (these will remain in the shaker, but are added to infuse some of the basil oils). 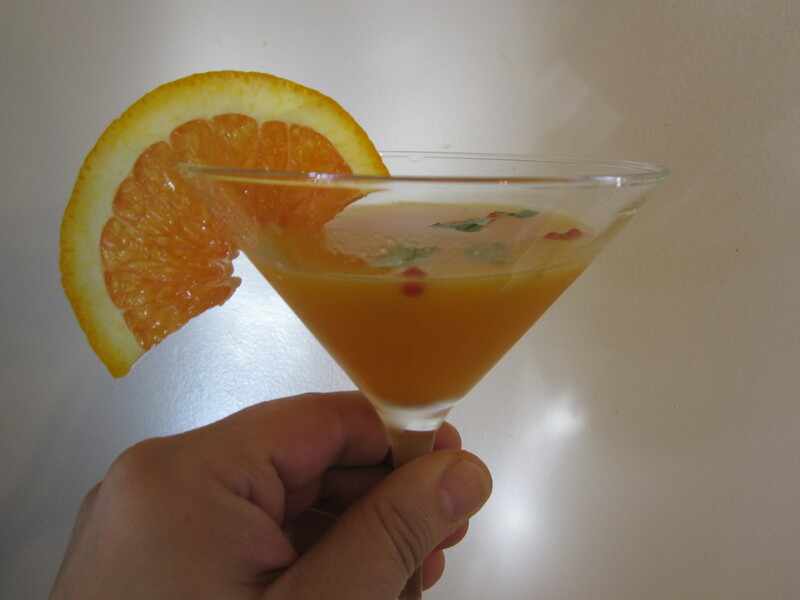 Pour into a martini glass, garnish with basil (maybe a whole leaf or just a few strips), a slice of orange on or in the glass, and a few pink peppercorns. You could also rim the glass by dipping into a bowl that has some Gran Marnier, then dip in colored sugar or stevia.